Mars Planets: the atomisation of the Mars Bar. An entropic dis-integration, the tendency of all things to become more chaotic, in confectionery form. I’m trying to resist the impulse to tie this stuff up to no-such-thing-as-Society atomisation because that’s not how we do things, right? And Mars Planets are better to share than a proper big Mars Bar, after all, for reasons of ease and hygiene. Nevertheless, my friends, here’s our chance to take a brave and random stand against entropy, to roll back the ticking clock of chocolate-coated chaos. Each packet of Planets is a little black pod of chocolate covered spheres: two thirds filled with a Mars Bar constituent (light Milky Way nougat, caramel) and then one odd third filled with malteser-ish wafer. The question is: can we re-integrate a Mars from these ingredients? 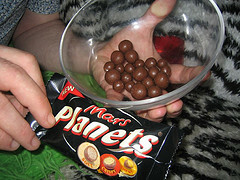 One regular packet of Mars Planets was refrigerated, to make the chocolate easier to remove from each Planet. 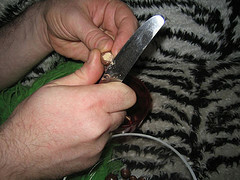 With the aid of a regular table knife, the chocolate was removed from each of the planets. [Note: it became clear that, for the two soft-ish centres, the most effective method of chocolate separation was to squeeze the Planet until the chocolate broke, and then just pick it off. 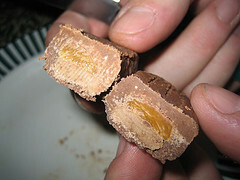 Once de-chocolated, we kept the caramel and nougat bits separated. 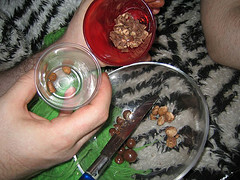 The Maltesers were set aside (i.e. scoffed). 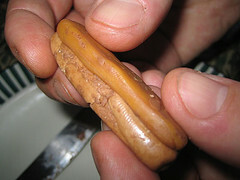 The caramel and nougat were squidged together and re-shaped into the vague proprtions of a Mars Bar, and then assembled into our Mars innards. This was fairly straightforward, it all held together nicely, and shaped without any problem. 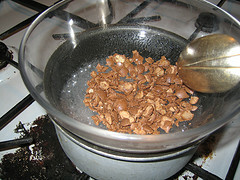 The flakes of chocolate were placed in a bain-marie and warmed. Hold on! THIS CHOCOLATE DOESN’T MELT! 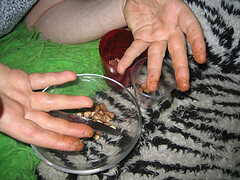 I remember childhood days of warmed chocolate turning to liquid in the pocket or the tiny hand, but something must have changed since then, in some mysterious, probably chemical, way. FURTHER SCIENCE REQUIRED. 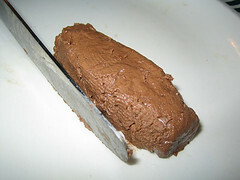 After ten to fifteen minutes in the bain-marie, the chocolate had reached the texture of un-set icing. So, slightly disappointed that we didn’t get to dip our tiny creation in a vat of molten deliciousness, the best we could do was was spread the choco-sludge over our naked Mars innards using a knife and a spoon. 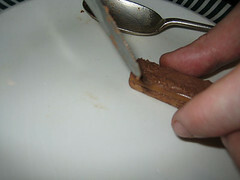 With three sides covered, the bar was cooled in the freezer to set the chocolate before the final (top) side was covered.The top side was distressed slightly with a knife to give a vague impression of the texturing of a regular mars bar. Then back to the freezer for a little while for the final set. 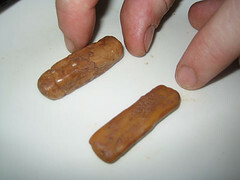 The size of the completed Mars Bar was about two inches long. VFM Alert! Mars Planets are about the same price as regular bar, but contain substantially less Mars for your money. And then the proof of the pudding: general concensus was that our mini-Mars was an entirely serviceable facsimile of the real thing. It is apparently possible to reconstruct bring a Mars Bar back from the Planets. 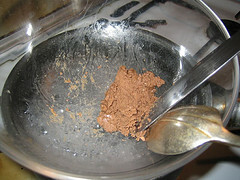 The only noticeable difference was that the chocolate was a bit granular, which was probably more a result of our having cooled it too quickly. But – oh! – it’s been eaten! And a more fundamental atomisation has begun. Entropy – I fought the law, and the law won. That chocolate JUST WOULD NOT MELT! It was worse than sppoky, it was downright WRONG. 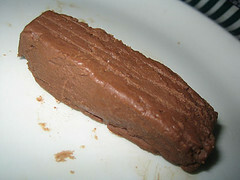 I hate to be a choc-rockist, but that rather suggests it doesn’t have much chocolate in it, surely? This year are we going to see how many planets we bash Mars up into? FISSIONTASTIC.